Mel Kiper Jr, Todd McShay and Chris Sprow select their favorite players in the Draft by position including QB (3:40), RB (5:25) and WR (8:00). Plus, your Mailbag questions. Kiper, McShay and Sprow discuss what the Cardinals might do with Rosen, and break down their Grade A mock drafts. Mel, Todd & Chris compare their latest mock drafts, have an epic disagreement on one top QB prospect (21:05) and more. Plus, they preview the draft strategy for the Ravens (27:33), Steelers (31:58), Browns (35:46) and Bengals (38:42). Russillo talks draft with Mel Kiper Jr. including the biggest disagreement he and McShay have, plus the first life advice guest joins the show. Mel, Todd & Chris take a deep dive into the mailbag to answer a variety of questions. Plus, they examine the draft strategy for the Texans (30:29), Colts (35:22), Titans (42:01) and Jaguars (46:25). Mel, Todd & Chris discuss what they took away from the combine, who made the best impression & more (1:34). Plus, they look at the draft strategy for the Chiefs (31:41), Chargers (36:32), Broncos (39:26) and Raiders (44:48). Mel Kiper Jr., Todd McShay & Chris Sprow debate whether it's smarter to build through free agency or the Draft THIS season (1:34), share their draft strategy for the Cardinals (25:41), 49ers (30:24), Seahawks (37:54) and Rams (42:38) and answer your #FirstDraft mailbag questions (49:15). Mel Kiper Jr., Todd McShay & Chris Sprow discuss comps for this year's top prospects (1:34) and break down the draft needs for the Jets (18:15), Bills (25:11), Dolphins (32:56) and Patriots (40:30). Plus, they answer your #FirstDraft mailbag questions (49:11). Todd, Mel & Chris break down McShay's latest mock draft, examine potential first round QBs (2:04), go rapid-fire (18:43) and answer your mailbag questions (33:58). Mel, Todd & Chris break down the best offensive weapons in this year's draft at RB (1:10), WR (16:51), TE (23:03) and more. Plus, your #FirstDraft mailbag questions (32:12). Todd McShay, Mel Kiper Jr. & Chris Sprow discuss the QB's who could make a splash at the draft (1:25), share their observations about players at the Senior Bowl (17:09), talk about some under-the-radar talent (23:44) and more. Plus, a loaded mailbag (35:45). Mel, Todd & Chris Sprow discuss the prospects they're keeping an eye on early this college football season. Before chatting with Bengals WR A.J. 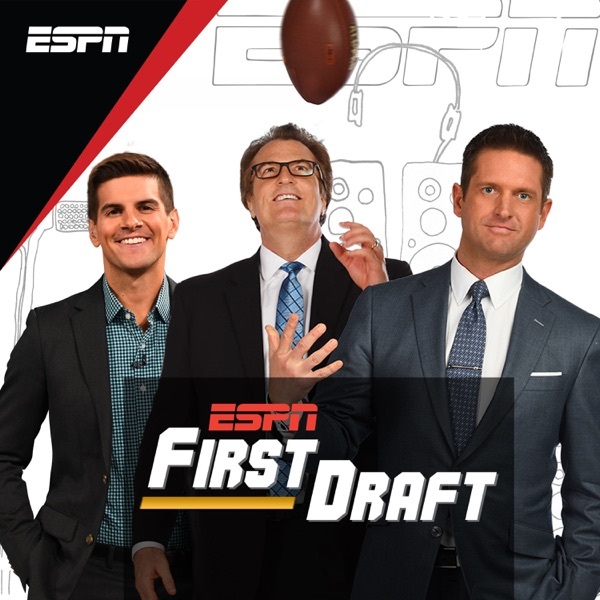 Green about his offseason and Cincy's draft class (29:35), Adam Schefter dishes with Mel Kiper Jr. and Todd McShay about their draft grades, what to look forward to next season, the majesty of breakfast for dinner and much more (:31). Mel, Todd and Chris put a bow on the 2018 draft by going through the best picks of all seven rounds, making their ROY picks, discussing the QB fits and much more. Marty talks with Heisman trophy winner and draft prospect Baker Mayfield about the highs and lows of his career. Plus, Ryan McGee joined Marty to chat about Mayfield. Mel, Todd and Chris discuss all of the buzz that they're hearing around the league as the first round gets closer, and Mel keeps it VERY real. In an exclusive interview, the would-be franchise QB goes deep on the NCAA, contemplates the fate of the planet and answers the critics who think he's radioactive. By Sam Alipour. Mel, Todd & Chris discuss several over/under prop bets from the NFL Draft including, QB's RB's and WR's drafted in the 1st & 2nd round, how many Alabama players will be drafted in the 1st round and more. Plus, the guys answer your mail bag questions. Mel, Todd & Chris discuss what the Patriots could be up to after their most recent deal (1:00). Plus, they examine the strategy for the Browns (24:16), Bengals (29:46), Ravens (33:44) and Steelers (38:22). Mel, Todd and Chris discuss what Odell Beckham Jr.'s value is in terms of draft capital (:45). Plus, they break down the draft strategy of the 49ers (25:40), Cardinals (30:50), Seahawks (34:32) and Rams (37:49). Mel, Todd & Chris break down the impact of the Jets moving up to No. 3 and more (1:53). Plus, they break down the strategy for the Broncos (28:04), Raiders (32:36), Chargers (34:26) & Chiefs (37:51). Mel, Todd & Chris discuss the impact of a whirlwind weekend on their draft projections. Plus, a deep dive on the strategies of the Bucs (33:28), Falcons (39:10), Panthers (42:17) and Saints (45:27). Mel, Todd and Chris do a complete recap of the scouting combine, discuss the "money makers" from the weekend, and break down the strategy for the Colts (26:01), Texans (29:25), Titans (32:14) and Jaguars (36:02). Todd McShay, Mel Kiper Jr., and Chris Sprow break down everything to watch for at the combine (:56) and examine the approach for the Bears (27:59), Packers (33:10), Lions (37:17) and Vikings (41:59). Mel Kiper Jr., Todd McShay and Chris Sprow debate the merits of free agency vs. the draft for some teams (2:20), plus they break down the draft strategy for the Jets (27:44), Dolphins (33:30), Bills (39:32) and Patriots (43:56). Mel Kiper Jr., Todd McShay and Chris Sprow discuss whether the top of the Big Board should correlate to the top of the draft and more (1:36). Plus, the guys start their team breakdowns with the Giants (24:33), Redskins (27:52), Cowboys (31:50) and Eagles (35:35). Mel Kiper Jr., Todd McShay and Chris Sprow discuss Todd's Mock Draft 2.0, the deepest positions in this year's draft, a Super Bowl LII recap and the guys answer your mailbag questions. Mel Kiper Jr., Todd McShay and Chris Sprow discuss the ripple effects of the Alex Smith trade (1:00), weigh in on what was learned at the Senior Bowl (19:15), debate the under-the-radar risers (33:48) and more. Mel Kiper Jr., Todd McShay and Chris Sprow examine the quarterbacks in this year's class, debate which teams have the biggest need at the position and much more. Mel Kiper Jr., Todd McShay and Chris Sprow break down the intricacies of Mel's first mock, explore some of the names you're less familiar with, discuss the QB rush and more. Mel Kiper Jr., Todd McShay and Chris Sprow discuss the strategy at the top of the draft (10:45), look at some of the best non-quarterbacks in the class (31:00) and more. Mel Kiper Jr., Todd McShay and Chris Sprow kick off Draft season by examining some of the best QBs (3:30), RBs (22:30), Offensive tackles (29:00) and pass rushers (33:15) in this year's class. First Draft shares the trailer for Season Two of 30 for 30 Podcasts, launching November 14th, as well as one of our favorite episodes from Season One, Dan & Dave. Former Redskins GM Scot McCloughan discusses what he's been up to, his thoughts on various QB & RB situations around the league, his thoughts on the 2018 QB class and more. Mel Kiper Jr., Todd McShay and Chris Sprow discuss the draftees who will have the biggest immediate impact in the league, the best sleepers from the Draft and more. Mel Kiper Jr., Chris Sprow and Todd McShay discuss the draft day decisions that could shock the NFL world, weigh in on "The Clean 7" and share their final analysis before Thursday's first round. NFL Draft Conference Call with Mel Kiper Jr.
Mel Kiper Jr., Todd McShay and Chris Sprow discuss the best fits for the top prospects in the draft. Plus, an in-depth explanation of why Mel's assessment of Jimmy Clausen is the reason for Cam Newton's success. Mel Kiper Jr., Todd McShay & Chris Sprow discuss the players that have risen and fallen the most throughout the draft process. Plus, they chat with top prospect Myles Garrett. Mel Kiper Jr., Todd McShay and Chris Sprow discuss their top three players at each position and break down the draft strategy for the Falcons, Rams, Vikings & Patriots. Mel Kiper Jr., Todd McShay & Chris Sprow discuss the best comparisons for the top players in the draft and break down the strategy for the Chiefs, Cowboys, Packers & Steelers. Mel Kiper Jr, Todd McShay & Chris Sprow discuss the day 3 sleepers to keep an eye on and examine the draft strategy of the Giants, Raiders, Texans & Seahawks. Mel Kiper Jr., Todd McShay and Chris Sprow examine free agency's impact on draft boards, go through Todd's latest mock and go in depth on the Bucs, Broncos, Lions & Dolphins. Mel Kiper Jr., Todd McShay and Chris Sprow share their biggest takeaways from the NFL Draft Combine and break down the strategy for the Eagles, Colts, Ravens and Redskins. Mel Kiper Jr., Todd McShay and Chris Sprow discuss the best players at each defensive position and break down the Draft day strategy of the Bengals, Bills, Saints & Cardinals. Mel Kiper Jr., Todd McShay and Chris Sprow discuss the best prospects at each offensive position and break down the draft strategy of the Titans, Jets, Chargers and Panthers. Mel Kiper Jr., Todd McShay and Chris Sprow discuss potential landing spots for the top running backs in the draft and start their team-by-team breakdowns with Cleveland, San Francisco, Chicago and Jacksonville. Mel Kiper Jr., Todd McShay and Chris Sprow play "QB musical chairs," delve into Todd's latest mock draft and debate which team is most likely to reach for a quarterback early. Mel Kiper Jr., Todd McShay and Chris Sprow share their impressions from the Senior Bowl, discuss their evaluations for the quarterbacks in this year's draft and much more. Mel Kiper Jr., Todd McShay and Chris Sprow examine Mel's first mock draft of the season and debate about the projections for several high-profile prospects. Mel Kiper, Todd McShay and Chris Sprow explain how the biggest story in NFL Draft history came out of last year's picks, look ahead to the early-entries of 2017 and more. Todd McShay, Mel Kiper Jr. and Chris Sprow dig into Todd's first mock draft of the season and examine what all 32 teams could be looking to do come Draft day. Mel Kiper Jr., Todd McShay and Chris Sprow dissect how the top of the draft order could take shape and debate the prospects those teams could be most keen on come draft day. Chris Sprow, Todd McShay and Mel Kiper Jr. debate which rookies have been the most valuable so far, juniors who could have a big impact on the 2017 draft and much more. Chris Sprow, Todd McShay and Mel Kiper Jr. discuss the best college environments, the poor QBs coming through the college pipeline, under-the-radar players to watch and more. Chris Sprow, Todd McShay and Mel Kiper Jr., discuss and debate their top college teams and top NFL prospects at this point in the season. Chris Sprow, Mel Kiper Jr., Todd McShay and Travis Haney discuss the top prospects in each college conference and much more. Chris Sprow, Mel Kiper Jr., and Todd McShay discuss the rookies to watch on the eve of Week 1 and discuss the impact of opening week in college football on their big boards. Chris Sprow, Mel Kiper Jr., Todd McShay and Travis Haney discuss the breakout players, most loaded teams and other things to watch entering the 2016 season. Mel Kiper Jr., Todd McShay and Chris Sprow discuss their favorite and least favorite draft classes, debate the best selections and pick their favorites for rookie of the year. Mel Kiper Jr., Todd McShay and Chris Sprow nominate their superlatives for the 2016 draft class as the first round rapidly approaches. Mel Kiper Jr., Todd McShay and Chris Sprow weigh in on the Eagles-Browns trade and go through the mock of mistakes to avoid.